This is the 1st Eagle of the American Silver Eagle Series started in 1986. This coin was minted at the San Francisco Mint. It is made from one ounce of .9993 pure American Silver, and is 40.6 mm in diameter. Proof coins are made from highly polished dies. They are hand fed into a coinage press one at a time, with each blank receiving two or more strikes from the dies to bring up sharp high-relief details. 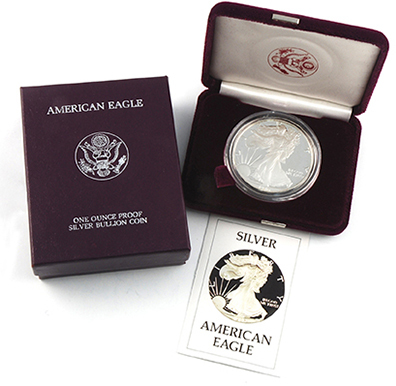 This Silver Eagle is in its Original Government Packaging (OGP). Get yours today!